No, I'm not hungover. That is the name of this polish by Spoiled. I'm not sure why, I don't really get a hung-over feeling from this polish. I have been eyeing it for a while at CVS, and last week they had a 2/$3.00 sale on the Spoiled stuff and I grabbed it and a color I regret deeply. It has a really nice foil (probably? I'm not good with jargon) finish, and was opaque after just two coats. I didn't apply a topcoat here, or do much clean-up. It's easy to work with and shiny as any pricey speciality store polish. When I was looking for swatches online before I bought it (doesn't everyone do that before they buy polish?) I could not find a decent one anywhere. What the hell? 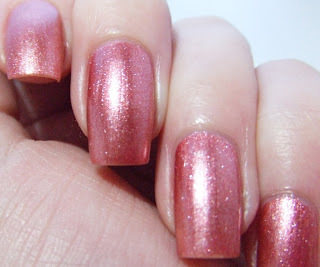 So here are a couple of mediocre photos of a lovely rosey polish.